Hosted by Dougal Austin & Jeremy Samson fortnightly on Melbourne's Sunday 94.1FM 3WBC (Whitehorse Boroondara Radio). 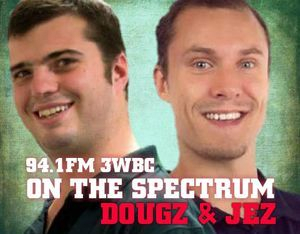 On The Spectrum is dedicated to raising awareness of Autism Spectrum Disorder & discussing topics related to the Autism / Asperger's community. 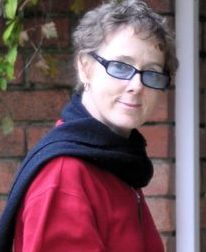 Donna Leanne Williams, also known by her married name Donna Leanne Samuel (born Donna Keene; 12 October 1963 - 22 April 2017, was an Australian writer, artist, singer-songwriter, screenwriter and sculptor. In 1965, aged two, Williams was assessed as "psychotic".During the rest of her childhood, she was tested multiple times for deafness and labelled as "disturbed". In 1991, she was diagnosed as autistic and also underwent treatment for gut, immune system and sensory perceptual disorders. She wrote four autobiographies – Nobody Nowhere: The Extraordinary Autobiography of an Autistic Girl (1992), Somebody Somewhere: Breaking Free from the World of Autism (1994), Like Colour to the Blind: Soul Searching and Soul Finding (1998) and Everyday Heaven: Journeys Beyond the Stereotypes of Autism (2004) – and released two solo music albums, Nobody Nowhere and Mutations. During the mid-1990s, she was the subject of several TV documentaries. Williams wrote textbooks on the autism spectrum and was a qualified teacher, international public speaker and autism consultant. On 9 December 2000, she married her second husband, Chris Samuel. The couple resided in Melbourne from 2002. Williams died of cancer on 22 April 2017. Donna Leanne Williams was born Donna Keene in October 1963. She grew up in Melbourne with an older brother, James, and a younger brother, Tom Williams (the street artist Duel; born 1969). According to Williams, her earliest memories included "rubbing her eyes furiously to lose herself in 'bright spots of fluffy color', which she found a soothing refuge against the 'intrusive gabble' of the human world around her".Her father, Ellis John Keene, later known as Jack Williams[why?] (1936–1995), was bipolar and aloof, while her mother was an alcoholic who was physically and emotionally abusive.In 1965, at the age of two, Williams was assessed as a psychotic infant; subsequently, throughout her childhood, she was tested multiple times for deafness and labelled as "disturbed". By the age of nine, she had developed two alternate personalities: "Willie", her "rebellious, disruptive, and bad-mannered side" and "Carol", the "kind, polite, socially acceptable child".That year, she was also diagnosed with various dietary conditions including "milk allergies, dairy [and] gluten intolerances[; and] salicylate intolerance" and was placed on a multivitamin and zinc regime. At fifteen, Williams left home and worked in various jobs but struggled to support herself. At times she was homeless, passing from boyfriend to boyfriend while suffering "gross cruelty and domestic prostitution in relationships with men". With the help of a psychiatric social worker, Williams finished secondary education[when?] and enrolled in tertiary studies.From 1982, Williams started studying at La Trobe University and eventually graduated with a Bachelor of Arts and Diploma of Education in 1990. In 1991, Williams was diagnosed with autism by Lawrence Bartak, a specialist at Monash Medical Centre and a senior lecturer in psychology at the associated Monash University. Bartak later recalled the "[Williams] displayed all the main features of autism when I met her, including one she wouldn't have known about ... The fact that she was apparently sociable and interacting with people doesn't mean she didn't have some type of disorder". Bartak helped Williams "begin building bridges instead of walls between worlds".In July 1996, doubts about Williams' condition were aired on Radio National's The Health Report and by The Australian newspaper. The claims of "faking it" were denied by both Williams and Bartak. In February 2005, David Smukler, writing in the American Association on Intellectual and Developmental Disabilities' journal Mental Retardation, noted that back in the mid-1990s some sceptics had a poorly defined understanding of the autism spectrum: "...autistic people such as Donna Williams and Temple Grandin started to publish first-person accounts that described their lives as autistic people living in an often-inhospitable nonautistic world. Many readers of these early accounts questioned whether or not the authors were really autistic. The assumption underlying such responses is that autism is so incapacitating that Williams or Grandin could not be autistic and still write with such insight and sensitivity. When their books first appeared, autistic authors were characterized either as frauds or exceptions". Smukler concluded: "Today, Williams' and Grandin's 'credentials' are rarely challenged. Rather than being doubted, they are more likely to be commended for offering us an 'inside out' view of autism".